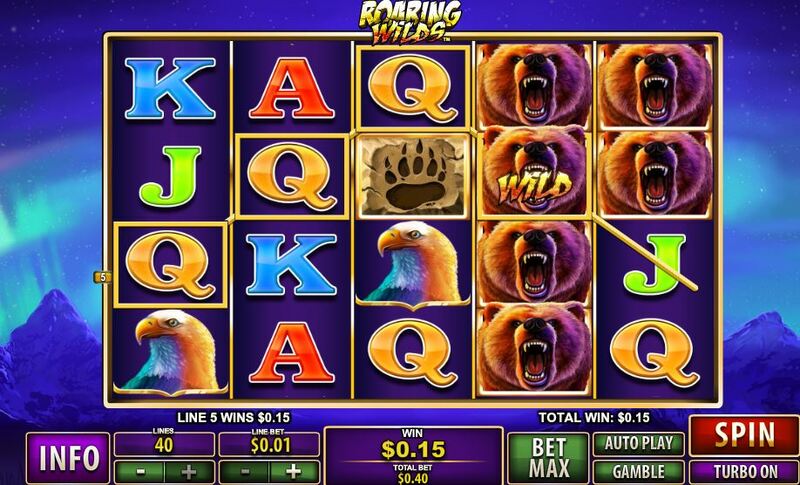 Roaring Wilds slot gets the name because of a rather aggressive-looking grizzly bear that forms one of the game's stacks. The stacks are the central focus as all symbols, which appear stacked on this 40 pay line 5 reel and 4 row slot. The theme is thus wildlife from N. America and Canada so you also see the wolf and cougar as well as the bear's favorite food, salmon - that's wild salmon and not tinned. The reels spin with little noise aside from the appropriate sounds of any animals if they form a winning combination. Our friend the bear forms the game's Wild and he appears stacked up to 4 rows high on all 5 reels. He is also the highest paying 5-of-a-kind at 25x stake thus giving a potential base game hit of 1000x for a full screen. On each spin a randomly - selected symbol will spin 'super stacked' in that it can be say 20 positions high instead of the normal maximum of 4. You can trigger free spins by landing 3 or more 'Big Cat' paw prints anywhere in view. Having landed the scatters necessary, you commence with 15 free spins. There is no multiplier and no obvious enhancement which is odd, I assumed maybe in the bonus all the super stacks would be the highest animal symbols but it appears not! You can retrigger the spins and the only difference I noticed was that although there are still super stacks of the lower card symbols, the animals tend to super stack more frequently than in the base game.